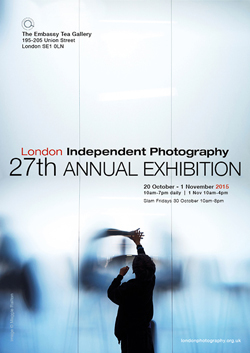 Welcome to London Independent Photography's 27th Annual Exhibition! This is the highlight of our group's calendar - all members have the opportunity to submit, so each year produces a totally new and unique show making it a must-see event for anyone interested and involved with photography in London. This year we received 660 submissions from 126 LIP members, with 119 images from 71 photographers accepted for the exhibition. Impartial selection is key to bringing a new approach to each exhibition, and to the varied and personal work of LIP members. Our independent selectors this year were Laura Pannack (multi award-winning London based photographer, focusing on social documentary and portraiture), Mike Poloway (experienced editorial and corporate photographer and educator based in Manchester, currently engaged on a long term project documenting Orthodox Judaism) and Greg Lucas (senior lecturer in photography, De Montfort University who describes his practice as 'Photography as Speculative Journalism'). The exhibition will run in the heart of creative Southbank at the Embassy Tea Gallery, which is owned by Artists Studio Company Limited (ASC), a major registered charity that exists to support visual artists, promote art and educate the public in the arts.